Materials for Spring Design & Wire Forming | James Spring and Wire Co.
Spring design and its fabrication play an important role in manufacturing and industry around the globe. 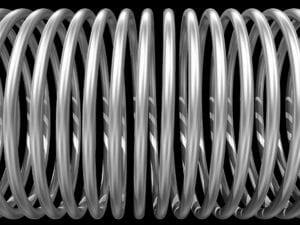 Springs come in all shapes and sizes to meet industry needs and are made from a wide range of metal alloys. Materials used for spring design and wire forming consist of high strength alloys. In general, wire formed into springs is cold rolled or drawn, and a made of medium to high carbon steel with high yield strength that allows for excellent elastic properties. Coil springs and flat springs are the two basic types of springs in use, with compression and extension springs the most common types of springs. The manufacturing of springs begins with the designing process, with attention given to the particular material relevant to the application. Design should be based on expected loads, the rate of usage, and physical dimensions. For example, extension springs decrease in diameter when resistance is applied and therefore working tolerances need to be calculated in the design. 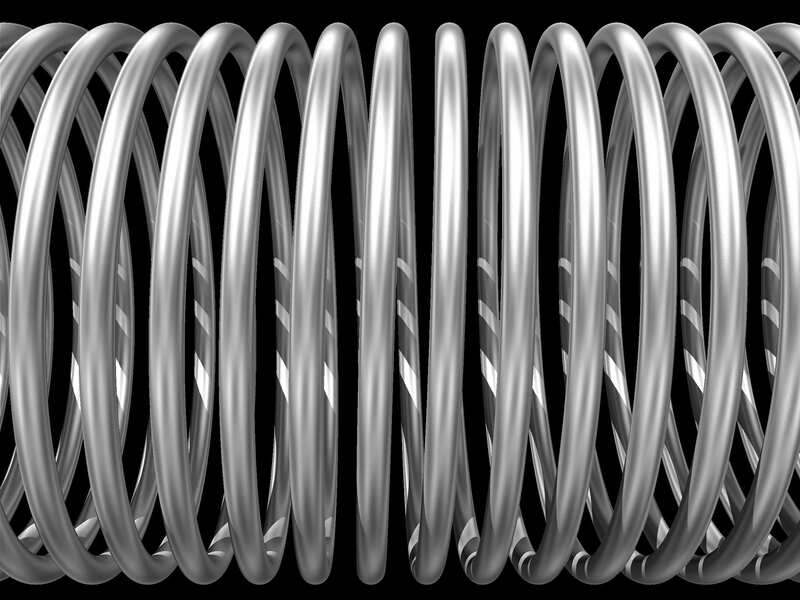 The mechanical principles of springs are very basic. They are an elastic component. Potential mechanical energy is stored in the elastic materials of the spring while in a relaxed position. That energy is released and expended without any external power source through absorption or resistance only when it is needed and without forceful deformation. Compression springs absorb, such as the suspension systems found in automobiles. Extension springs resist and return moving objects back to their starting positions, such as those found on garage doors. As basic as springs are, their component function in machinery and equipment are essential to manufacturing as a whole and as an intricate part in a variety of finished products. Springs are often manufactured with tempered steel or stainless steel consisting of varying degrees of chromium alloys, depending on the environmental conditions for the application. Other metals used include copper, bronze, and titanium. Plastics are also used in the manufacture of springs. From paperclips to medical devices, toasters to earthquake-proof foundations, trampolines to complex transportation systems, springs are used in a wide variety of applications and consumer goods. They are found around the home, in manufacturing plants, and in nearly all sectors of transportation. As mentioned, extension springs are resistant to stretching forces. They are the familiar cylindrical shaped coils with hooks or loops at each end for connecting components. How tightly the wire coils are wound determines how much energy is stored and released when the coils are spread between components. All the coils are active and potential energy is stored within while retracted. When a pulling force is applied, the tension within the spring is deformed and will attempt to return to its initial zero-deflection state. Examples of extension springs are found in garage doors, door closers, vise grips, trampolines, automotive interiors, and carburetors. Depending on the application, these types of wires will necessarily have different uses, purposes, and special properties in the manufacture of springs. Method of manufacturing include processes such as cold-drawn for uniform tensile strengths, cold rolled annealed or oil tempered, corrosion resistance for nearly all environmental extremes and conditions, the need to withstand high temperature with lower stress, non-magnetic alloys, or the need to conduct electricity. As technologies have advanced and improved in metalworking and heat-treating, improvements in spring manufacturing have occurred as well. Today’s springs have more elasticity, are more durable, and can carry greater loads. However, successful spring manufacture begins with the designing process and the consideration of materials and functional demands of the intended application of the spring. For the success of the industry, the successful spring design is absolutely indispensable.